David mourned the treacherous murder of Abner. The death of Saul removed the dangers that had made David an exile. The way was now open for him to return to his own land. When the days of mourning for Saul and Jonathan were ended, "David inquired of the Lord, saying, Shall I go up into any of the cities of Judah? And the Lord said unto him, Go up. And David said, Whither shall I go up? And He said, Unto Hebron." Hebron was twenty miles north from Beersheba, and about midway between that city and the future site of Jerusalem. It was originally called Kirjath-arba, the city of Arba, the father of Anak. Later it was called Mamre, and here was the burial place of the patriarchs, "the cave of Machpelah." Hebron had been the possession of Caleb and was now the chief city of Judah. It lies in a valley surrounded by fertile hill country and fruitful lands. The most beautiful vineyards of Palestine were on its borders, together with numerous plantations of olive and other fruit trees. David and his followers immediately prepared to obey the instruction which they had received from God. The six hundred armed men, with their wives and children, their flocks and herds, were soon on the way to Hebron. As the caravan entered the city the men of Judah were waiting to welcome David as the future king of Israel. Arrangements were at once made for his coronation. "And there they anointed David king over the house of Judah." But no effort was made to establish his authority by force over the other tribes. One of the first acts of the new-crowned monarch was to express his tender regard for the memory of Saul and Jonathan. Upon learning of the brave deed of the men of Jabesh-gilead in rescuing the bodies of the fallen leaders and giving them honorable burial, David sent an embassy to Jabesh with the message, [p. 698] "Blessed be ye of the Lord, that ye have showed this kindness unto your lord, even unto Saul, and have buried him. And now the Lord show kindness and truth unto you: and I also will requite you this kindness." And he announced his own accession to the throne of Judah and invited the allegiance of those who had proved themselves so truehearted. The Philistines did not oppose the action of Judah in making David king. They had befriended him in his exile, in order to harass and weaken the kingdom of Saul, and now they hoped that because of their former kindness to David the extension of his power would, in the end, work to their advantage. But David's reign was not to be free from trouble. With his coronation began the dark record of conspiracy and rebellion. David did not sit upon a traitor's throne; God had chosen him to be king of Israel, and there had been no occasion for distrust or opposition. Yet hardly had his authority been acknowledged by the men of Judah, when through the influence of Abner, Ishbosheth, the son of Saul, was proclaimed king, and set upon a rival throne in Israel. Ishbosheth was but a weak and incompetent representative of the house of Saul, while David was pre-eminently qualified to bear the responsibilities of the kingdom. Abner, the chief agent in raising Ishbosheth to kingly power, had been commander-in-chief of Saul's army, and was the most distinguished man in Israel. Abner knew that David had been appointed by the Lord to the throne of Israel, but having so long hunted and pursued him, he was not now willing that the son of Jesse should succeed to the kingdom over which Saul had reigned. The circumstances under which Abner was placed served to develop his real character and showed him to be ambitious and unprincipled. He had been intimately associated with Saul and had been influenced by the spirit of the king to despise the man whom God had chosen to reign over Israel. His hatred had been increased by the cutting rebuke that David had given him at the time when the cruse of water and the spear of the king had been taken from the side of Saul as he slept in the camp. He remembered how David had cried in the hearing of the king and the people of Israel, "Art not thou a valiant man? and who is like to thee in Israel? wherefore then hast thou not kept thy lord the king? . . . This thing is not good that thou hast done. As the [p. 699] Lord liveth, ye are worthy to die, because ye have not kept your master, the Lord's anointed." This reproof had rankled in his breast, and he determined to carry out his revengeful purpose and create division in Israel, whereby he himself might be exalted. He employed the representative of departed royalty to advance his own selfish ambitions and purposes. He knew that the people loved Jonathan. His memory was cherished, and Saul's first successful campaigns had not been forgotten by the army. With determination worthy a better cause, this rebellious leader went forward to carry out his plans. Mahanaim, on the farther side of Jordan, was chosen as the royal residence, since it offered the greatest security against attack, either from David or from the Philistines. Here the coronation of Ishbosheth took place. His reign was first accepted by the tribes east of Jordan, and was finally extended over all Israel except Judah. For two years the son of Saul enjoyed his honors in his secluded capital. But Abner, intent upon extending his power over all Israel, prepared for aggressive warfare. And "there was long war between the house of Saul and the house of David: but David waxed stronger and stronger, and the house of Saul waxed weaker and weaker." At last treachery overthrew the throne that malice and ambition had established. Abner, becoming incensed against the weak and incompetent Ishbosheth, deserted to David, with the offer to bring over to him all the tribes of Israel. His proposals were accepted by the king, and he was dismissed with honor to accomplish his purpose. But the favorable reception of so valiant and famed a warrior excited the jealousy of Joab, the commander-in-chief of David's army. There was a blood feud between Abner and Joab, the former having slain Asahel, Joab's brother, during the war between Israel and Judah. Now Joab, seeing an opportunity to avenge his brother's death and rid himself of a prospective rival, basely took occasion to waylay and murder Abner. "Died Abner as a fool dieth? David's magnanimous recognition of one who had been his bitter enemy won the confidence and admiration of all Israel. "All the people took notice of it, and it pleased them: as whatsoever the king did pleased all the people. For all the people and all Israel understood that day that it was not of the king to slay Abner the son of Ner." In the private circle of his trusted counselors and attendants the king spoke of the crime, and recognizing his own inability to punish the murderers as he desired, he left them to the justice of God: "Know ye not that there is a prince and a great man fallen this day in Israel? And I am this day weak, though anointed king; and these men the sons of Zeruiah be too hard for me: the Lord shall reward the doer of evil according to his wickedness." Abner had been sincere in his offers and representations to David, yet his motives were base and selfish. He had persistently opposed the king of God's appointment, in the expectation of securing honor to himself. It was resentment, wounded pride, and passion that led him to forsake the cause he had so long served; and in deserting to David he hoped to receive the highest position of honor in his service. Had he succeeded in his purpose, his talents and ambition, his great influence and want of godliness, would have endangered the throne of David and the peace and prosperity of the nation. "When Saul's son heard that Abner was dead in Hebron, his hands were feeble, and all the Israelites were troubled." It was [p. 701] evident that the kingdom could not long be maintained. Soon another act of treachery completed the downfall of the waning power. Ishbosheth was foully murdered by two of his captains, who, cutting off his head, hastened with it to the king of Judah, hoping thus to ingratiate themselves in his favor. They appeared before David with the gory witness to their crime, saying, "Behold the head of Ishbosheth the son of Saul thine enemy, which sought thy life; and the Lord hath avenged my lord the king this day of Saul, and of his seed." But David, whose throne God Himself had established, and whom God had delivered from his adversaries, did not desire the aid of treachery to establish his power. He told these murderers of the doom visited upon him who boasted of slaying Saul. "How much more," he added, "when wicked men have slain a righteous person in his own house upon his bed? shall I not therefore now require his blood of your hand, and take you away from the earth? And David commanded his young men, and they slew them. . . . But they took the head of Ishbosheth and buried it in the sepulchre of Abner in Hebron." After the death of Ishbosheth there was a general desire among the leading men of Israel that David should become king of all the tribes. "Then came all the tribes of Israel to David unto Hebron, and spake, saying, Behold, we are thy bone and thy flesh." They declared, "Thou wast he that leddest out and broughtest in Israel: and the Lord said to thee, Thou shalt feed My people Israel, and thou shalt be a captain over Israel. So all the elders of Israel came to the king to Hebron; and King David made a league with them in Hebron before the Lord." Thus through the providence of God the way had been opened for him to come to the throne. He had no personal ambition to gratify, for he had not sought the honor to which he had been brought. More than eight thousand of the descendants of Aaron and of the Levites waited upon David. The change in the sentiments of the people was marked and decisive. The revolution was quiet and dignified, befitting the great work they were doing. Nearly half a million souls, the former subjects of Saul, thronged Hebron and its environs. The very hills and valleys were alive with the multitudes. 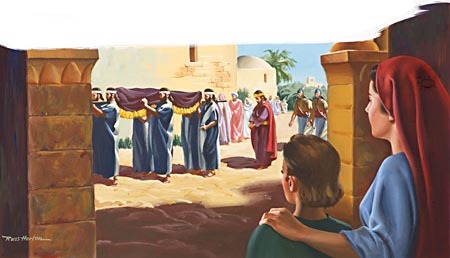 The hour for the coronation was appointed; the man who had been expelled from the court of Saul, who had fled [p. 702] to the mountains and hills and to the caves of the earth to preserve his life, was about to receive the highest honor that can be conferred upon man by his fellow man. Priests and elders, clothed in the garments of their sacred office, officers and soldiers with glittering spear and helmet, and strangers from long distances, stood to witness the coronation of the chosen king. David was arrayed in the royal robe. The sacred oil was put upon his brow by the high priest, for the anointing by Samuel had been prophetic of what would take place at the inauguration of the king. The time had come, and David, by solemn rite, was consecrated to his office as God's vicegerent. The scepter was placed in his hands. The covenant of his righteous sovereignty was written, and the people gave their pledges of loyalty. The diadem was placed upon his brow, and the coronation ceremony was over. Israel had a king by divine appointment. He who had waited patiently for the Lord, beheld the promise of God fulfilled. "And David went on, and grew great, and the Lord God of hosts was with him." 2 Samuel 5:10. Click here to read the next chapter: "The Reign of David"